Global warming is the most significant environmental issue of our time, yet public response in Western nations has been meager. Why have so few taken any action? In Living in Denial, sociologist Kari Norgaard searches for answers to this question, drawing on interviews and ethnographic data from her study of “Bygdaby,” the fictional name of an actual rural community in western Norway, during the unusually warm winter of 2001-2002. In 2001-2002 the first snowfall came to Bygdaby two months later than usual; ice fishing was impossible; and the ski industry had to invest substantially in artificial snow-making. Stories in local and national newspapers linked the warm winter explicitly to global warming. Yet residents did not write letters to the editor, pressure politicians, or cut down on use of fossil fuels. 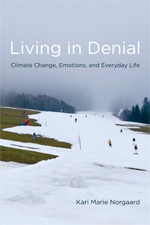 Norgaard attributes this lack of response to the phenomenon of socially organized denial, by which information about climate science is known in the abstract but disconnected from political, social, and private life, and sees this as emblematic of how citizens of industrialized countries are responding to global warming. Norgaard finds that for the highly educated and politically savvy residents of Bygdaby, global warming was both common knowledge and unimaginable. Norgaard traces this denial through multiple levels, from emotions to cultural norms to political economy. Her report from Bygdaby, supplemented by comparisons throughout the book to the United States, tells a larger story behind our paralysis in the face of today’s alarming predictions from climate scientists. Kari Marie Norgaard is Assistant Professor of Sociology at the University of Oregon.